Clay Aiken – On Broadway! Sponsored by BroadwayCares/Equity Fights Aids, the 22nd Annual Easter Bonnet Competition was held on Tuesday, April 29, 2009 at the Minskoff Theatre. The performance was the culmination of a 6 week fundraiser that pitted the different stage productions against each other to raise money for the charity. Spamalot had only participated for 2 weeks, but the cast and crew worked hard by posing for pictures, giving backstage tours and auctioning off bits of costumes and stage props. 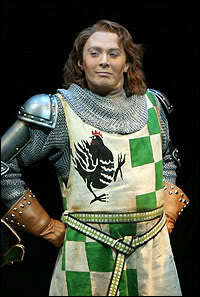 Clay Aiken spent hours leading the way and encouraging his fans to help out. Many of the participating shows participated in the April 29th event by presenting an ornate “Easter Bonnet”, accompanied by a short skit. Clay Aiken and Hannah Waddingham sang a serious and beautiful rendition of “The Prayer.” But, because it was Spamalot, there had to be a twist. Just as the audience was enjoying the beautiful song, the nun from Spamalot made an appearance…..on roller skates. How did Clay and Hannah keep a straight face as they continued to sing? At the end of the show, it was announced that the Broadway musical “Rent” won the top prize in the competition by raising a record $277,740. “Spamalot” was the runner-up with a total of $264,900 raised. The grand total for the fundraiser was $3,734,129. This total proved that all of the Broadway community were winners that day. The following is a video of the performance of the Spamalot cast, featuring Clay and Hannah singing The Prayer. David Foster composed this beautiful song in 1999 and won TheGolden Globe for Best Original Song in a movie! Thank you, CANN for the video of OMC and Hannah Washington! Beautiful vocals and hilarious comedic skit! Always loved this version of "The Prayer". It would have been nice to have an official recording of it. Hannah's and Clay's voices just blend together so well. Error: Error validating access token: Session has expired on Tuesday, 21-Aug-18 16:13:01 PDT. The current time is Thursday, 25-Apr-19 07:57:18 PDT.